While U.S. Attorney General Jeff Sessions' recent statements have raised questions about cannabis' future in states that have legalized it, there may be another federal issue that pushes prohibition talks further. As Pennsylvania joined 28 other states that allow medical marijuana, police and health department officials told medical users that there will be an enforced deadline to turn in their firearms. 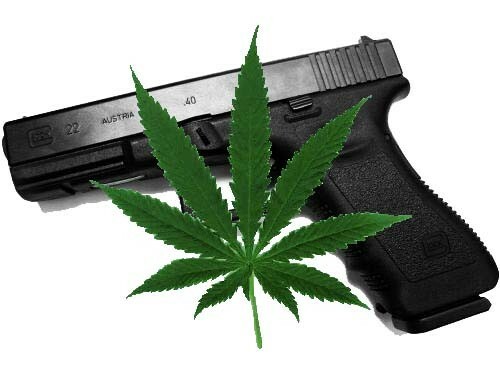 The order follows the Gun Control Act of 1968, which prohibits anyone from possessing guns if they unlawfully use or are addicted to cannabis. "They're going to have to make a choice," John T. Adams, president of the Pennsylvania District Attorneys Association, told the Associated Press. "They can have their guns or their marijuana, but not both." The plan was for those purchasing marijuana to be put on an online database available to state policing bodies, but now Pennsylvania's Department of Health is not taking part in the database and asking the federal government to reconsider the drug's scheduling. The patients' registry would have been seen in a background check, excluding them from purchasing firearms in the state. Instead, law enforcement will need a patient's actual medical marijuana ID card to verify their participation, with no information found in background checks. In 2016, Chief District Judge Gloria Navarro of the Ninth U.S. Circuit Court of Appeals ruled that the federal ban of gun sales to state-legal medical marijuana users did not violate the Second Amendment. The federal Bureau of Alcohol, Tobacco, Firearms and Explosives (ATF) added a warning of the exclusion to their Firearms Transaction Record form for the gun purchasers. Buying a firearm would result in perjury charges — a felony — for cannabis consumers. It is unclear how gun ownership will change as states see more consumers in both the medicinal and recreational pot market than ever before. In Washington state, the medical marijuana authorization is not connected to any registry so it presumably would not affect prospective gun owners' right to purchase or carry a gun at the state level. But Washington's Department of Health does recognize that owning firearms is federally illegal for users. The original print version of this article was headlined "Guns or Weed?"